NEW HAVEN, Conn. (AP) — Andraya Yearwood hears the comments, usually from adults and usually not to her face. She shouldn't be running, they say, not against girls. "We all know the outcome of the race before it even starts; it's demoralizing," she said. "I fully support and am happy for these athletes for being true to themselves. They should have the right to express themselves in school, but athletics have always had extra rules to keep the competition fair." Joanna Harper, a medical physicist and transgender runner from Portland, Oregon, says the issue isn't that simple. She believes there needs to be a standard based on hormone levels. Until hormone therapies begin to work, genetic males have a distinct advantage over genetic females, she said. Most transgender teens don't begin hormone therapy until after puberty. Younger teens can be on puberty-blocking drugs, but puberty is very individualized and testosterone levels can vary greatly from one transgender girl to another, she said. Jon Forrest, whose daughter is teammates with Soule, is among a group of parents seeking a similar change to Connecticut's state policy. He said they'd like to see the state adopt a hormone standard or allow transgender girls to run with other girls but have their results placed in a separate exhibition category. "The facts show Glastonbury would be the state champion based on cisgender girls competing against cisgender girls," he said. "You don't realize it until you see it in person, the disparity in the ability to perform." Yearwood's coach, Brian Calhoun, said his runner also matters. 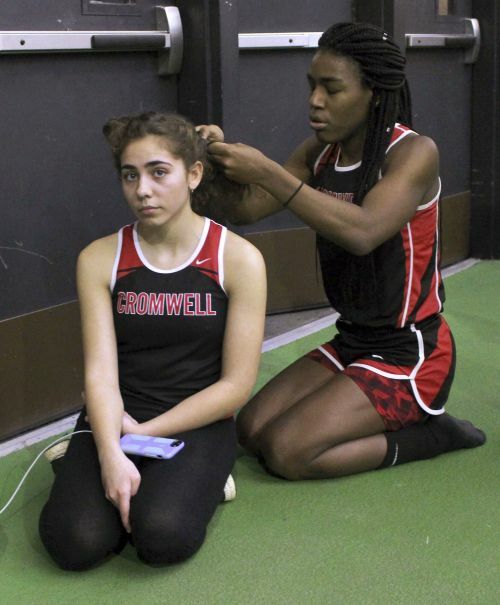 As Yearwood kneeled behind a teammate, braiding her hair between races at another recent meet, Calhoun said the track team and community have provided the runner with a safe, welcoming place to be.